I’ve just started taking advantage of a new (?) feature in iTunes 7: you can sync podcasts to an iPod from one iTunes library, while the rest of the iPod is synced with another. 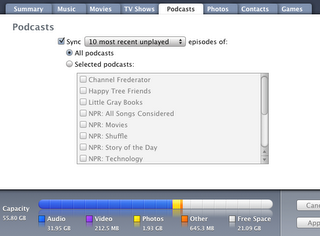 Now, you can keep syncing music and such with the old iTunes library, but get podcasts from the new iTunes library. Addendum: It seems that syncing back with the old library will delete the podcasts from the new library. No big deal, if you don’t mind waiting for them to be reloaded when you next sync with the new library.